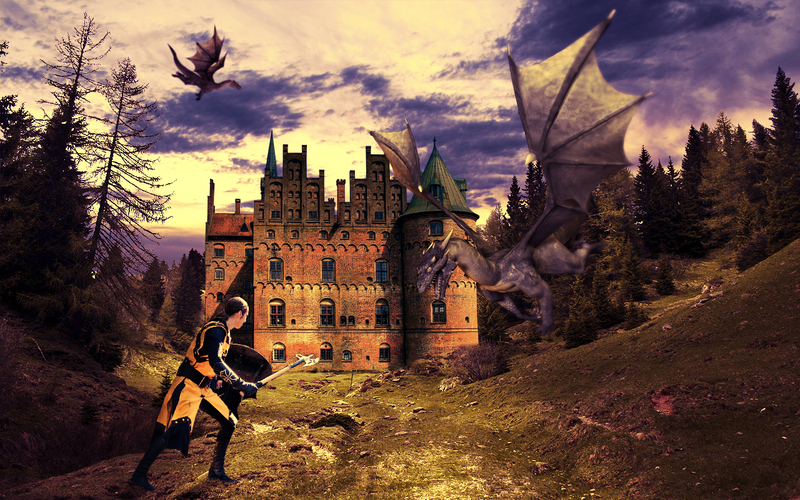 In this photo manipulation tutorial I will show you how to create an image with dragons, knights and castles. I’ll show you how to replace a sky in a photo and how to create a surreal scene. Let’s get started! These are the stock photos that I used. Please read their rules before using them in any kind of project. The artists who created them worked hard and we have to respect their work. Below is the image that we are going to create in this tutorial. Create a new document in Photoshop (Ctrl/Cmd + N). My document is 1280px wide and 800px high. 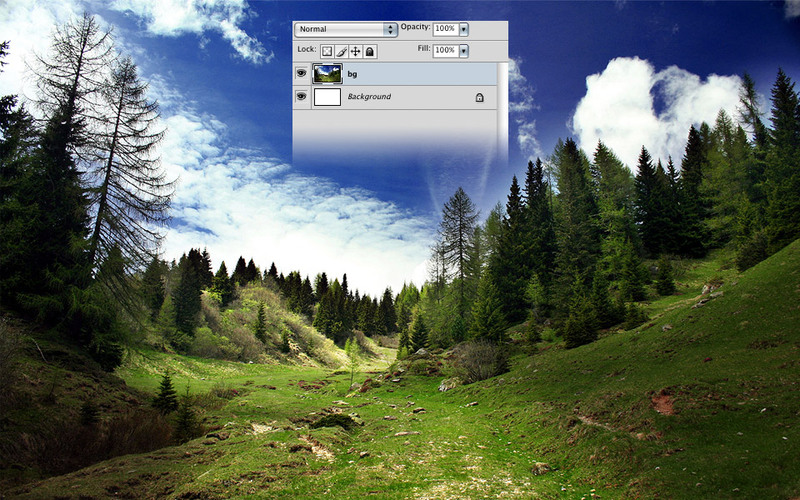 Then download this photo, open it in Photoshop and move it into your document using the Move Tool (V). Name this layer “bg” and use Free Transform (Ctrl/Cmd + T) to change its size. To make the background sharper go to Filter > Sharpen > Sharpen. Now we will make a selection of the sky because we will replace it later. Go to the Channels panel and duplicate the Blue channel (it has the strongest contrast between the sky and the land) by dragging it over the ‘Create new channel’ button from the bottom of this panel. Now we need to make the sky as white as possible and the land as black as possible. Follow the steps described in the image below. Then Ctrl/Cmd-click on the thumbnail of this channel to select the white area. Activate the RGB channel and go back to the Layers panel. Inverse the selection (Select > Inverse) and hit Ctrl/Cmd + J to create a new layer using the selected area. Name this layer “land”. Download this sky photo and open it in Photoshop. Use the Move Tool (V) to move the photo into your document. Name this layer “sky” and put it underneath the “land” layer. 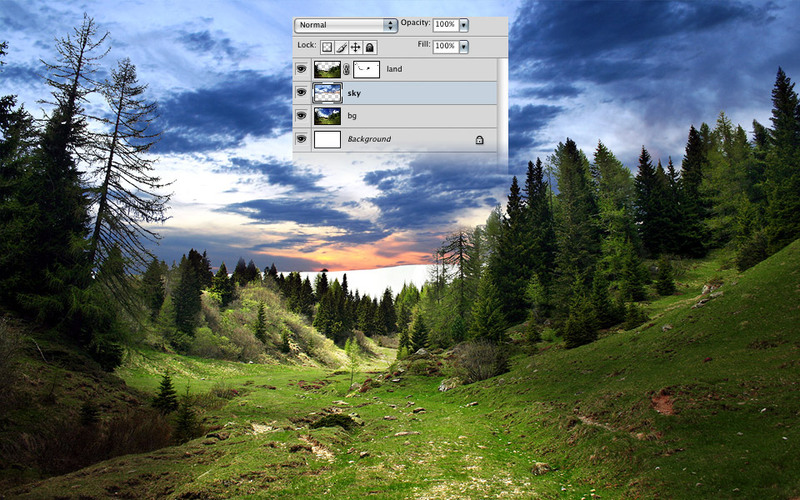 Then go to Edit > Free Transform (Ctrl/Cmd + T) and change the size of the “sky” layer. Don’t worry if there is a white area left in the middle of the image. It will be covered later by a castle. You can also add a mask to the “land” layer (Layer > Layer Mask > Reveal All) and use a black brush (B) to erase some parts of the trees where you think it’s necessary. 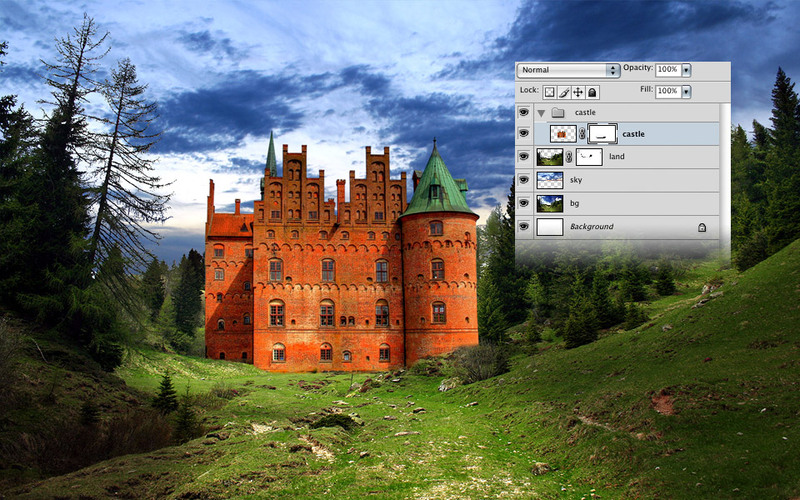 Download this castle photo, use the Pen Tool (P) to separate the castle from the background and move it into your first document. 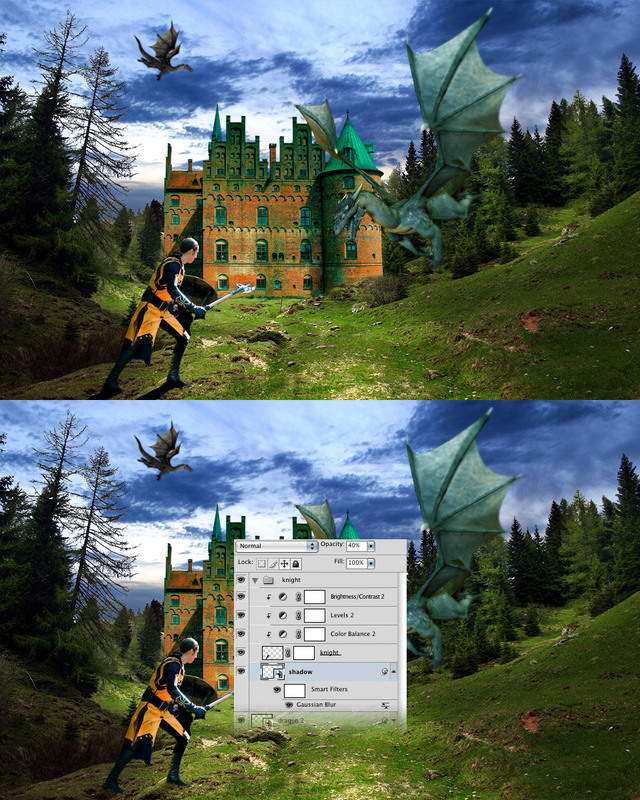 Name this layer “castle”, go to Edit > Free Transform (Ctrl/Cmd + T) and change its size. 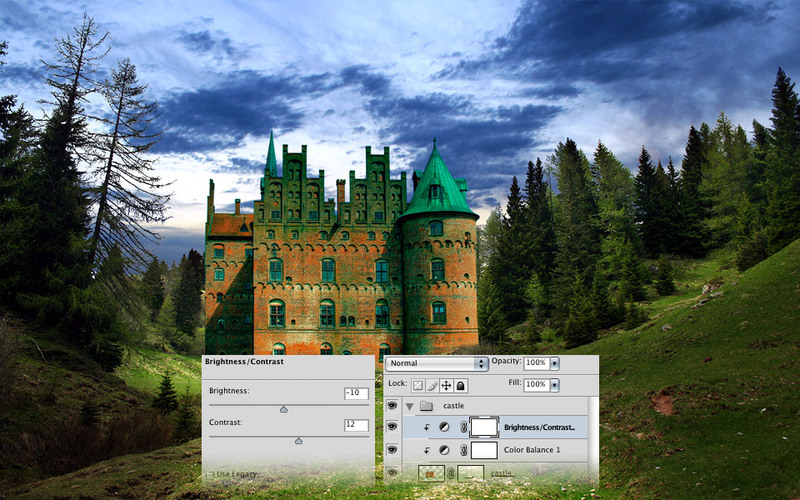 Add a mask to the “castle” layer by clicking on the mask button from the bottom of the Layers panel. Then select a small black brush (B) and use it to erase the bottom area of the castle to make it look like it’s really there, in the forest. 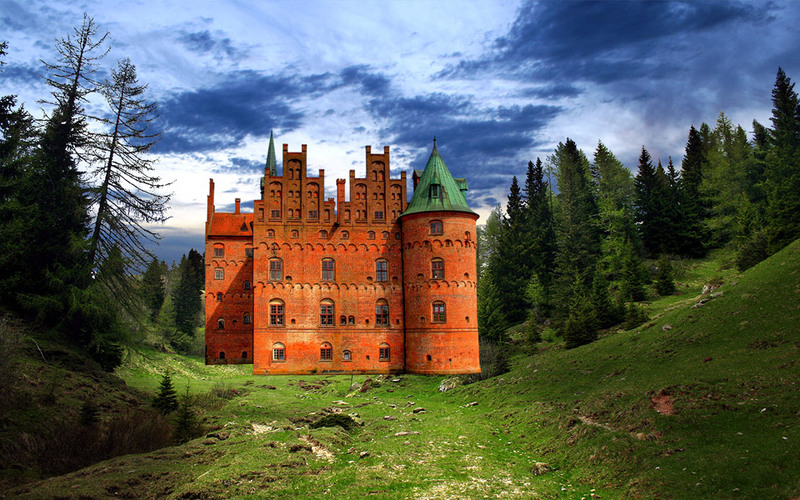 Put this layer inside a group (Ctrl/Cmd + G) and name it “castle”. Now we will adjust the color of the castle. 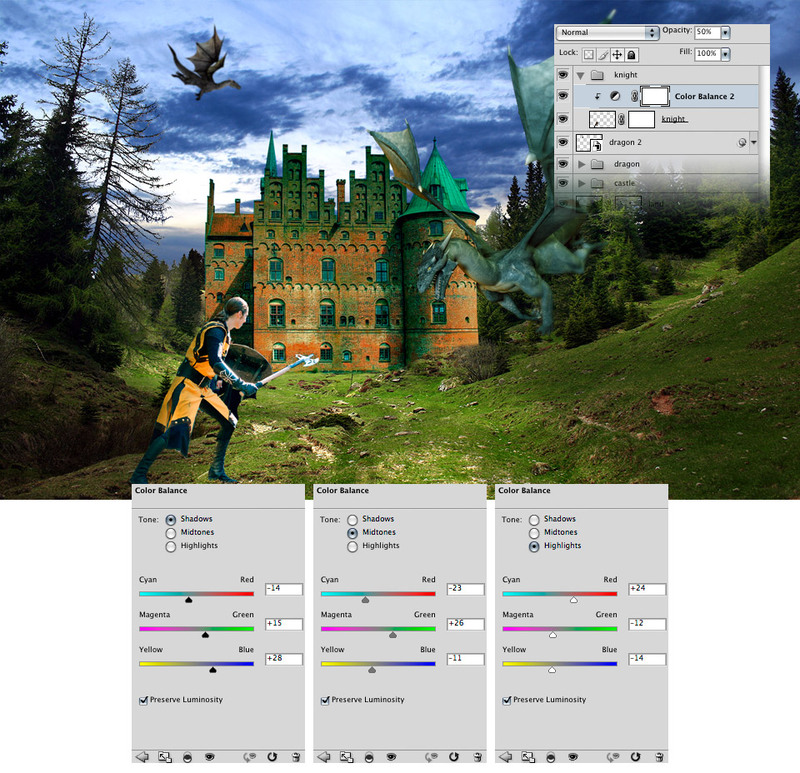 Go to Layer > New Adjustment Layer > Color Balance, tick the “Use Previous Layer to Create Clipping Mask” option and use the settings from the following image. 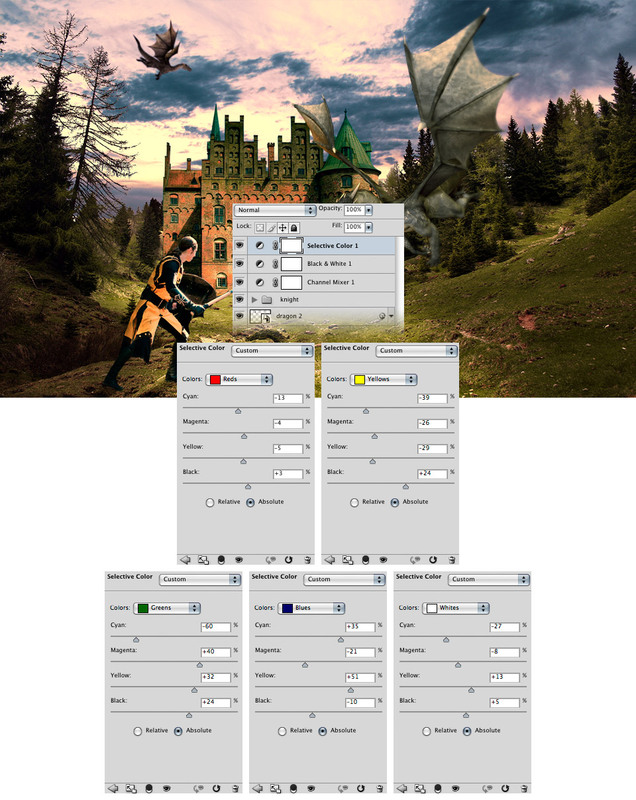 Go to Layer > New Adjustment Layer > Brightness/Contrast, tick the “Use Previous Layer to Create Clipping Mask” option and use the settings from the following image. 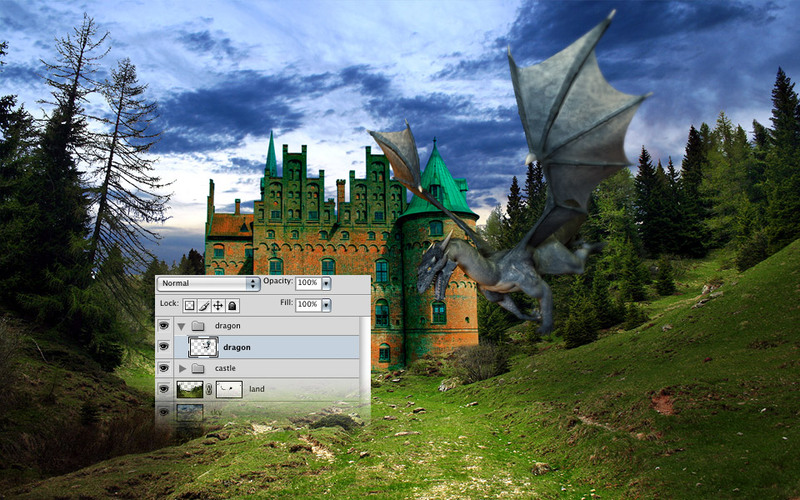 Download this dragon image, open it in Photoshop and use the Move Tool (V) to move it into your first document. Name this layer “dragon”. Then go to Edit > Free Transform (Ctrl/Cmd + T), change the size of this layer and flip it horizontally. 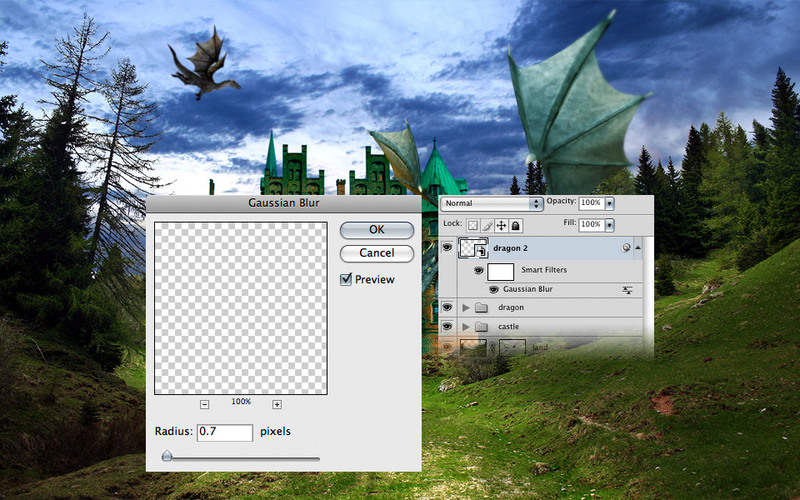 Select the Blur Tool and use it to give a little blur to the left wing of the dragon and his legs. Put this layer inside a group (Ctrl/Cmd + G) and name it “dragon”. 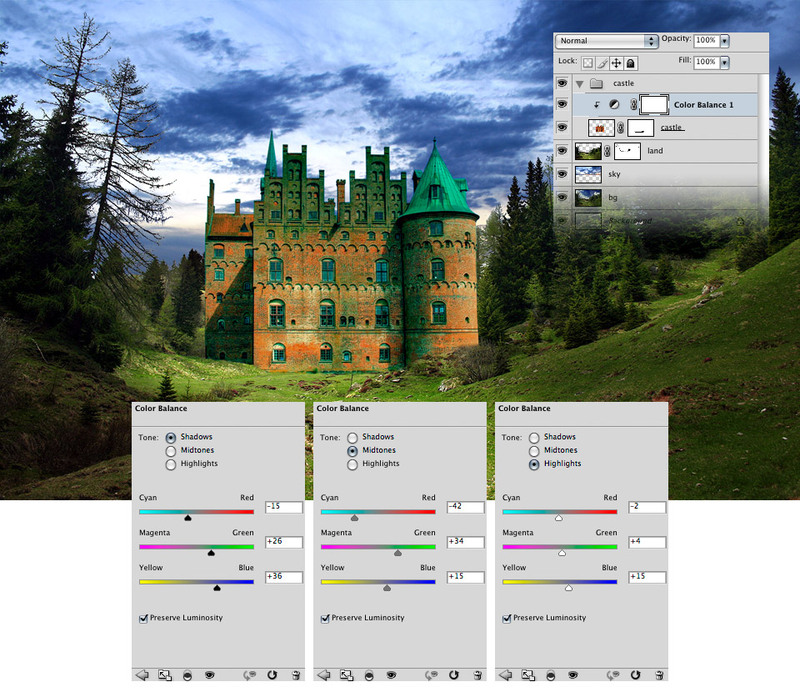 Go to Layer > New Adjustment Layer > Color Balance, tick the “Use Previous Layer to Create Clipping Mask” option and use the settings from the following image. Go to Layer > New Adjustment Layer > Levels, tick the “Use Previous Layer to Create Clipping Mask” option and use the settings from the following image. Use the Paint Bucket Tool (G) to fill the mask of this adjustment layer with black. 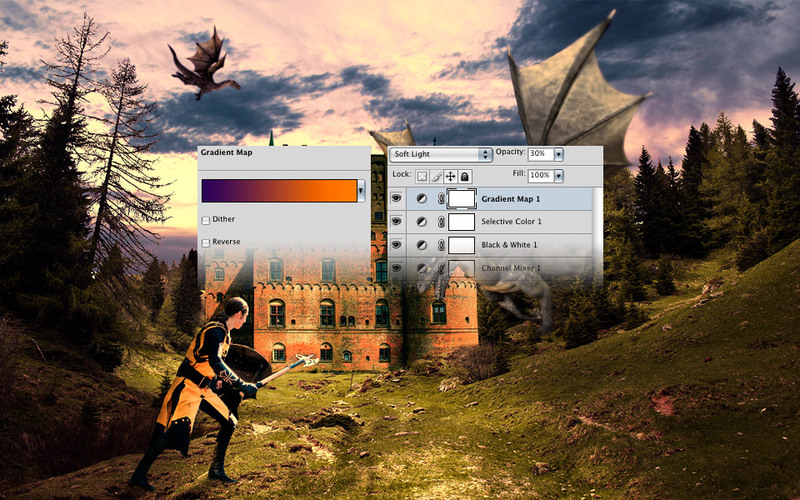 Then select a white soft brush (B) and paint with it over different areas of the dragon. 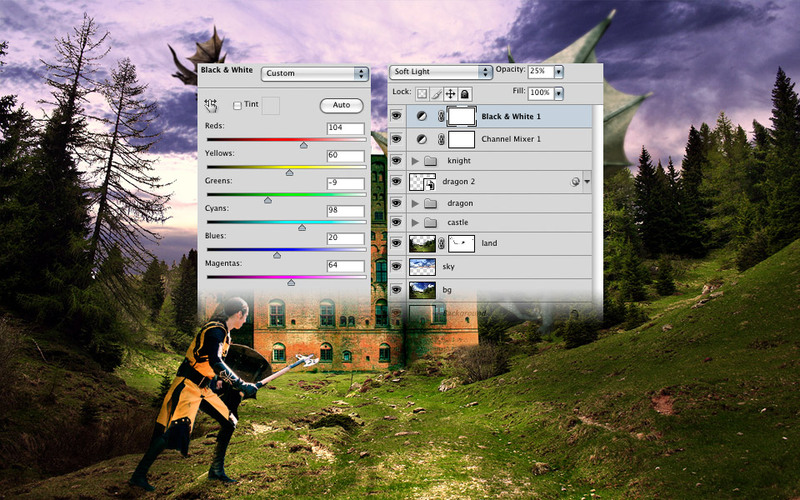 Ctrl/Cmd-click on the thumbnail of the “dragon” layer to select it. Create a new layer and fill the selection with black. 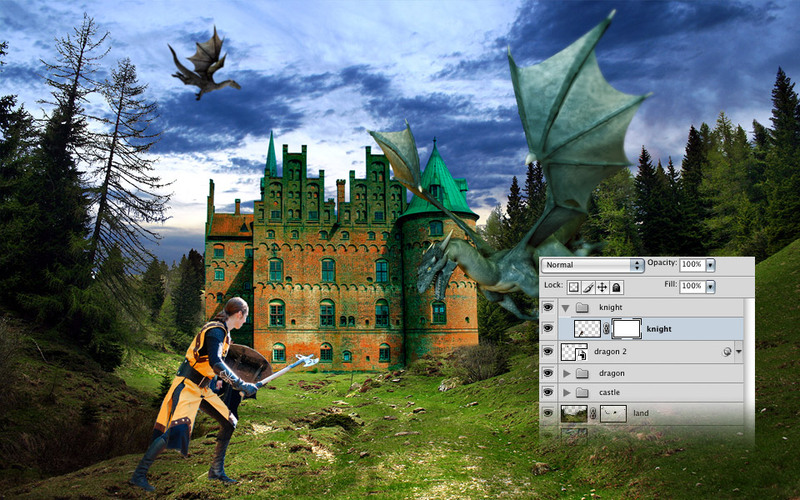 Put this layer underneath the “dragon” layer, right-click on it and select Convert to Smart Object. Then go to Edit > Free Transform (Ctrl/Cmd + T), hold down the Ctrl/Cmd key and modify the corners of the transformation box as you see in the image below. Go to Filter > Blur > Gaussian Blur and set the radius to 2.5px. Name this layer “shadow” and set its opacity to 22%. 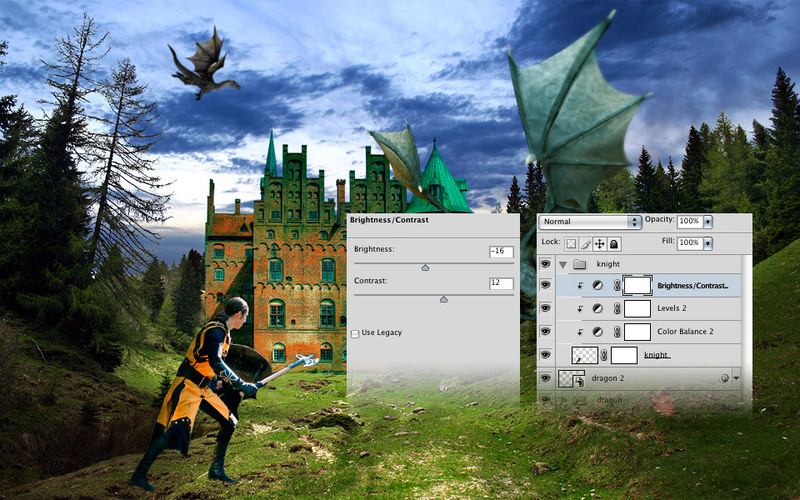 Download this dragon image and open it in Photoshop. 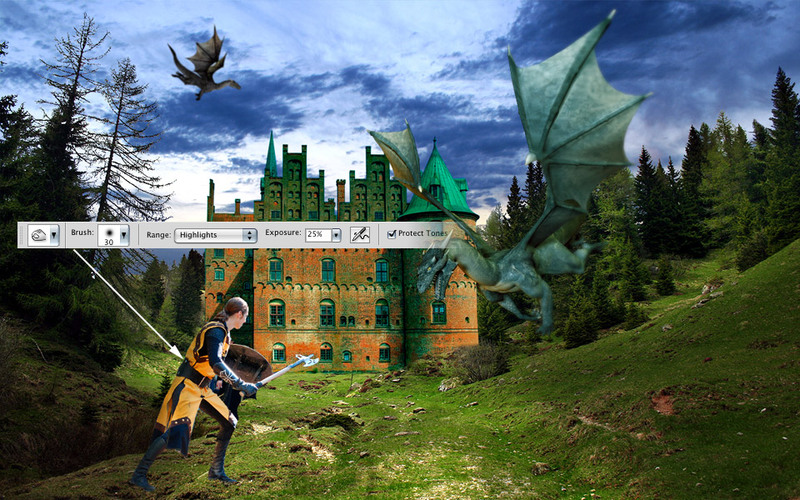 Use the Move Tool (V) to move the dragon into your first document. Then go to Edit > Free Transform (Ctrl/Cmd + T) and make this layer smaller. 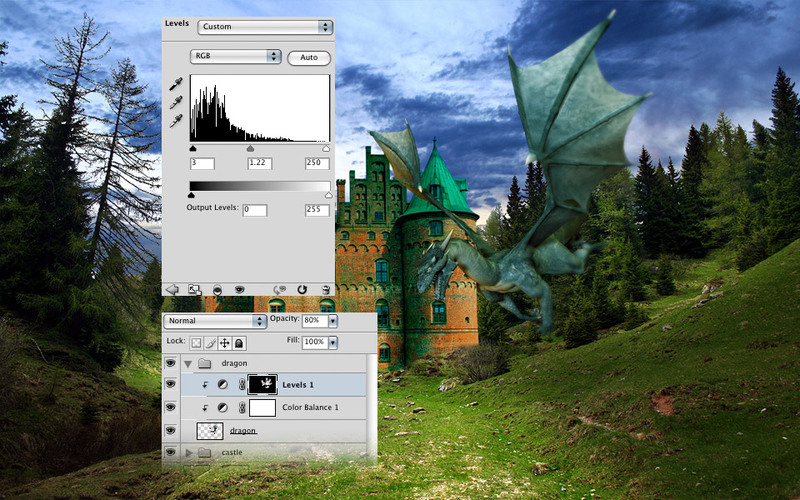 Name this layer “dragon 2″ and add a 0.7px gaussian blur filter to it. Download this photo and open it in Photoshop. Use the Pen Tool (P) to separate the man from the background and then move him into your first document. 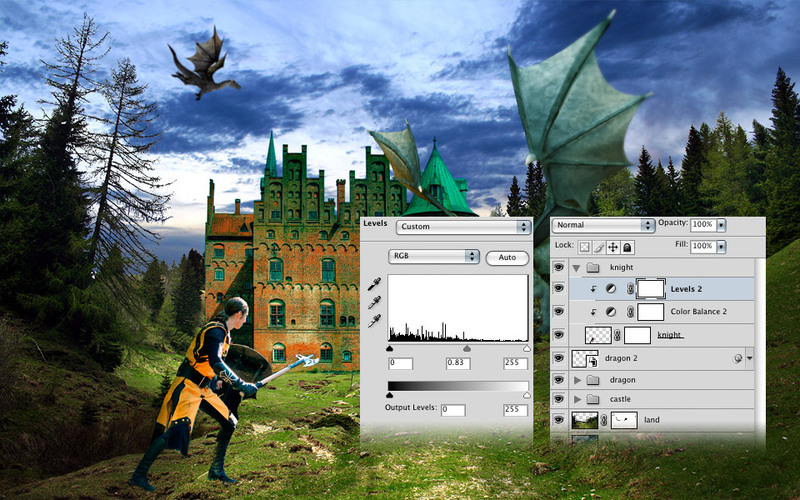 Name this layer “knight”, go to Edit > Free Transform (Ctrl/Cmd + T) and change its size. We want to make it look like the knight is preparing for a fight with the dragon. Hit Ctrl/Cmd + G to put this layer inside a group and name it “knight”. Add a mask to the “knight” layer and use a black brush to erase the bottom area of the man’s boots. 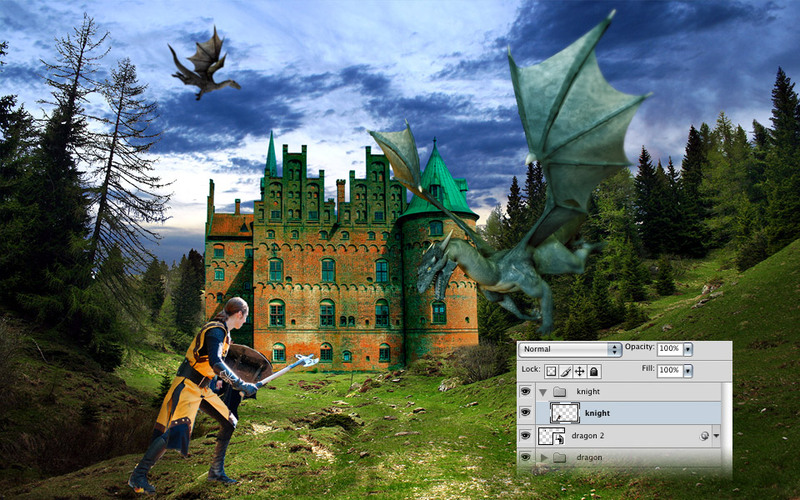 Select the Burn Tool and use the settings from the following image to make the left area of the knight darker. Make sure that the “knight” layer is selected. Then go to Layer > New Adjustment Layer > Color Balance, tick the “Use Previous Layer to Create Clipping Mask” option and use the settings from the following image. Set the opacity of this layer to 50%. Go to Layer > New Adjustment Layer > Levels, tick the “Use Previous Layer to Create Clipping Mask” option and use the settings from the following image. Create a new layer and use a black hard brush (B) to paint a shadow for the knight. Name this layer “shadow”, right-click on it, select Convert to Smart Object, and then move it underneath the “knight” layer. Add a 2px gaussian blur to the “shadow” layer and then set its opacity to 40%. Now we will do some color adjustments to the image. 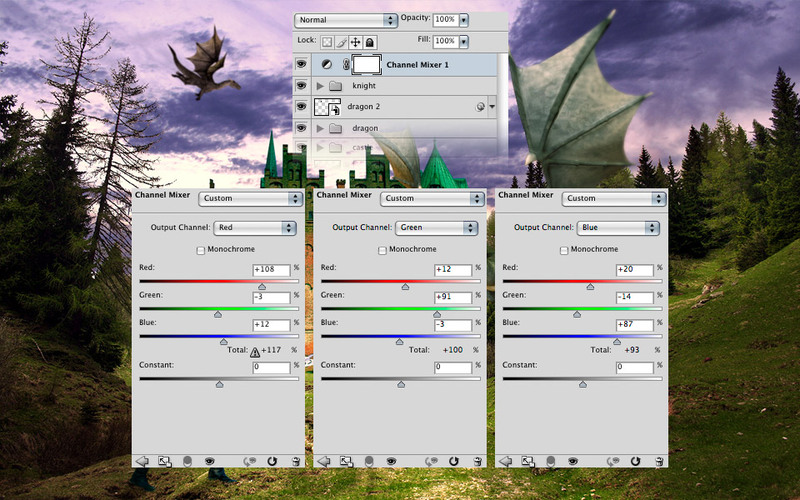 Add a new Channel Mixer adjustment layer and use the settings from the following image. Add a new Black & White adjustment layer and use the settings from the following image. Set the blend mode of this layer to Soft Light 25%. Add a new Selective Color adjustment layer and use the settings from the following image. 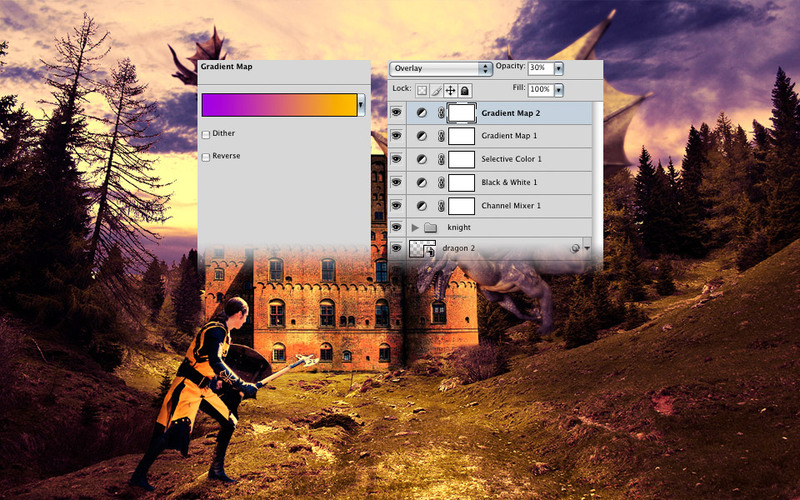 Add a new Gradient Map adjustment layer and use the settings from the following image. To create the gradient I used the colors #290a59 and #ff7c00. Set the blend mode of this layer to Soft Light 30%. 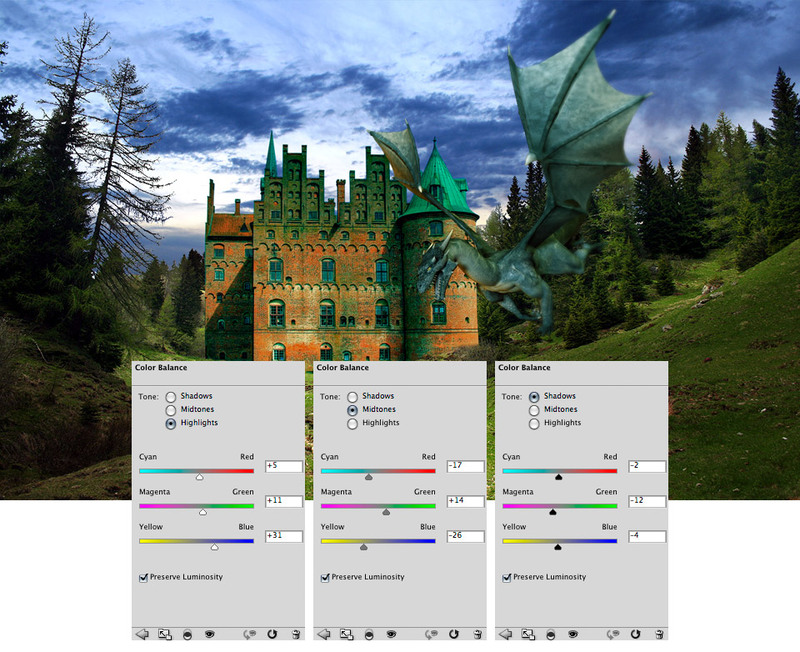 Add a new Gradient Map adjustment layer and use the settings from the following image. To create the gradient I used the colors #290a59 and #ff7c00. Set the blend mode of this layer to Overlay 30%. Below you can see the surreal scene that we created. I hope that you enjoyed this tutorial and you learned some new things. Register for a Premium account and you will be able to download all resources from Graphstock, and the one we will release in the next year.